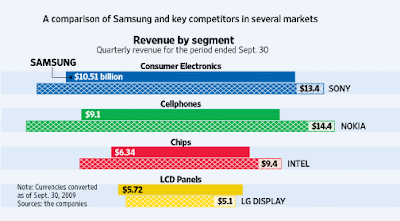 The Korea International Trade Association recently re-published an article from the Wall Street Journal on the size of Samsung Electronics and the challenges it faces. In terms of size, it is already about the size of Hewlett-Packard with roughly $110 billion in annual sales. About one third of its revenues come from companies that compete with it in selling television sets, computers, mobile handsets, semiconductors and other electronic devices. The best example of this is Apple, which is one of its biggest customers for flash memory chips and screens. As shown in the accompanying graphic , Samsung is now a leading player in several key markets within the ICT sector. It achieved this status without major acquisitions and by running its own factories. As the article notes, this is similar to what IBM did back in the 1980s, making both the components for electronics products and the actual devices sold to consumers.